Paintings and Ceramic Sculptures by Dottie Dracos: Checkers the Rooster! 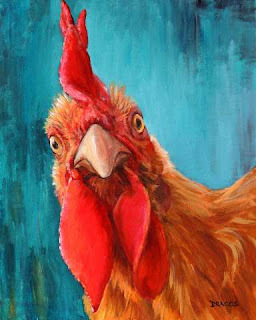 This is one of my daughter's chickens, an adorable rooster that my granddaughter named "Checkers" for some unknown reason. But Checkers it is! I spent around an hour with him last week, taking photos and making sketches, and here's the painting that resulted from our little visit. It's an acrylic painting on a stretched 16x20x3/4" canvas and is for sale on Etsy, along with prints of the painting. I just love how feisty he is, and I think I may have to do at least one more painting of him. 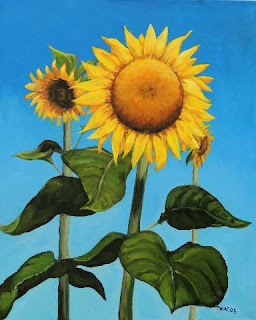 I also redid the sunflower painting again, and I really like it better now. It's much happier looking!